Have you ever thought how to get fresh herb in your own kitchen without inviting dirt and bugs along. The answer is AeroGrow AeroGarden kit which is an indoor herb garden that allows you to grow fresh herbs at anytime of the year. AeroGrow has been making indoor plant equipment for years and they have a huge amount of satisfied customer base which allows them to keep making products such as this indoor herb growing kit. The reason why this small indoor herb growing product went so famous in very short span is because it is set up indoor and that allows you to grow herbs all day long. Usually the herb growing season ends with the start of winters but not with this AeroGrow AeroGarden kit. It save you hundreds of dollars which you spend each year for getting fresh herbs. Now you can get your own herbs without even leaving your kitchen. This kits works round the clock and fits nicely on any countertop. The other great feature that I really liked about this product is that it does not require soil so you keep all the dirt away from your kitchen and not to mention to dirt and no bugs. Many people have reported that the herbs are ready to be harvested after 25 days of germination and they keep growing and the growth rate is almost five times faster than herbs grown in soil. So far in this review we haven’t shed any light on the construction of this indoor kit so lets start with its lighting which is essential for plant growth. This indoor herb growing kit is equipped with its own light that turn ON and OFF according to the requirement of the plant thus providing natural lighting according to the time of the day. The built-in microprocessor is responsible for switching the lights whenever required plus it also gives and indication when the herbs require more water or nutrients to be added to its base. For optimal plant health, nutrient tablets are provided with this kit to maintain good health of plants and other herbs. 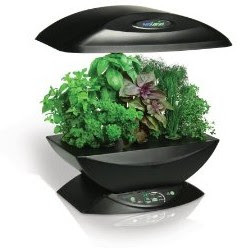 With your AeroGro AeroGarden in your kitchen, you can grow your own salad greens, gourmet herbs, chili peppers, cherry tomatoes, cascading petunias, and several types of basil. Just cut from the pot and put in a pan to get the tasted of fresh herbs all year long.